FLUSHING (WABC) -- Police reported Tuesday afternoon that they have captured an alligator that was spotted in Queens. The New York City Police Department captured the alligator, taped its mouth and took it away. The alligator was first seen Monday near Meadows Lake. A fisherman said he spotted it. "Thought it was a rat at first. 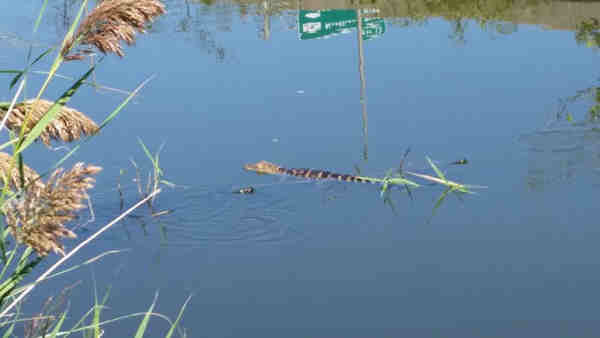 The closer I looked, I realized it was a gator," fisherman Joe Genovese said. The alligator was seen in a waterway that runs through Flushing Meadows-Corona Park and feeds into Meadow Lake. The alligator was reportedly about 2 feet long. NYC Parks' Urban Park Rangers were monitoring the site.